Delight the Minecraft Obsessed Kid in your Home with this Minecraft Printable Party Pack containing everything you need to get the party plan rolling! Get it FREE using the coupon code: MINEFORFREE at checkout. Minecraft is a big deal in our house. It’s kinda like online Lego but without spending hours trying to find the exact 0.0004 inch square needed to finish the thousand piece helicopter. And without the clean up. And price tag. To all the lego fan Moms out there – I’m not saying it’s better – I’m just saying as far as online gaming goes, Minecraft isn’t half bad. It manages to keep my eleven year old AND seventeen year old entertained. And that’s pretty darn impressive. If your family has been infected by the Mincraft Bug then chances are you will throw at least one, maybe a few more, Minecraft Themed Birthday Parties. And I’m about to make this a whole lot easier. How to Host a Minecraft Birthday Party. I’ve done this more than once. Three times to date. So I feel as if I know what I’m talking about when it comes to hosting a Minecraft themed party. 2. 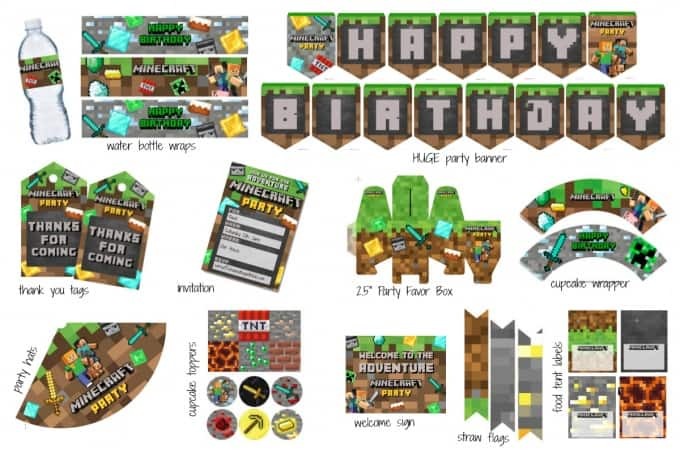 The Perfect Minecraft Party Decorations – Remember You can get this ENTIRE Minecraft Party Pack FOR FREE HERE (BUT YOU MUST use the code MINEFORFREE at checkout). 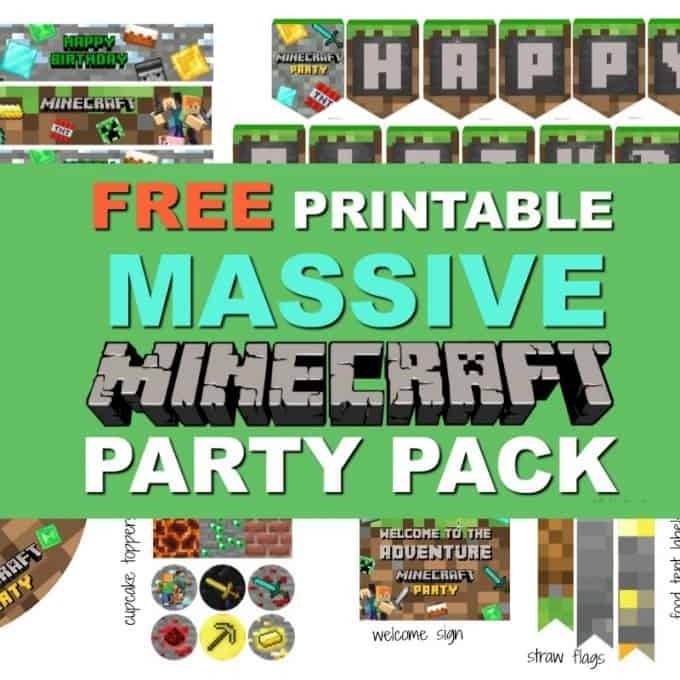 What does the MASSIVE Minecraft Printable Party Pack Include? I’ve squeezed a whole lot of Minecraftiness into this Party Pack. The printable can be downloaded in PDF format ready is ready to print in a letter-sized sheet.